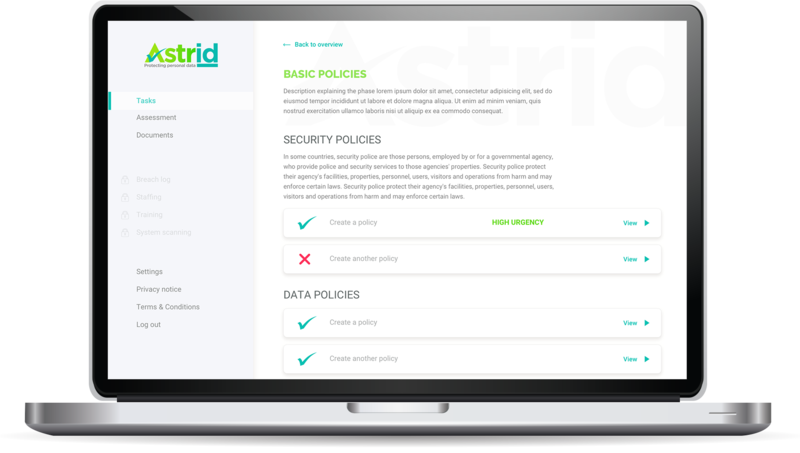 Developed with SMEs in mind, our secure online platform shows you what you need to do, and gives you the tools and information you need - all broken down into practical, manageable steps, to remove the fear factor of GDPR. We don’t hold or process your company’s personal and sensitive data for you. 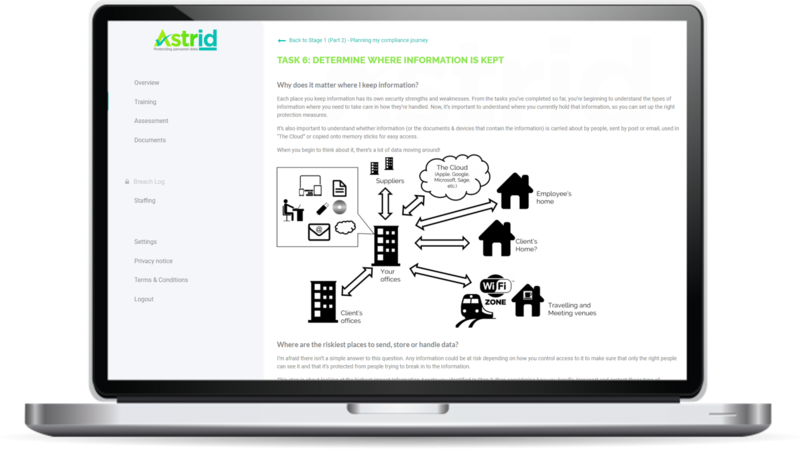 The only personal data we hold about you and your business is contact and billing information, your Astrid employee training records and the GDPR compliance evidence you upload to our system (we encrypt this evidence to keep it secure). And I’m afraid we don’t make GDPR go away - we help you face it head on and rise to the challenge of securing the personal data you hold. Your company (and your appointed accountable person) remain responsible for GDPR compliance. Our online platform is designed to be affordable for sole proprietors and microbusinesses, ensuring that even the smallest of companies can comply with GDPR. All our customers have full access to our platform - we promise that there are no catches and no hidden extra costs. Our prices are subject to VAT. Payment is made annually via card payment using secure payment system, Stripe. We do not store your payment details, these are held by Stripe. Ready to become GDPR compliant? Not ready to buy today? Access the full suite of tools and guidance to become GDPR compliant. Simply create an account, subscribe to the right package for your organisation and get started straight away. Access Astrid for free! Run our assessment and see what you still need to do to become GDPR compliant and sample of some of our tools and guidance. Just create an account below and choose the free package.